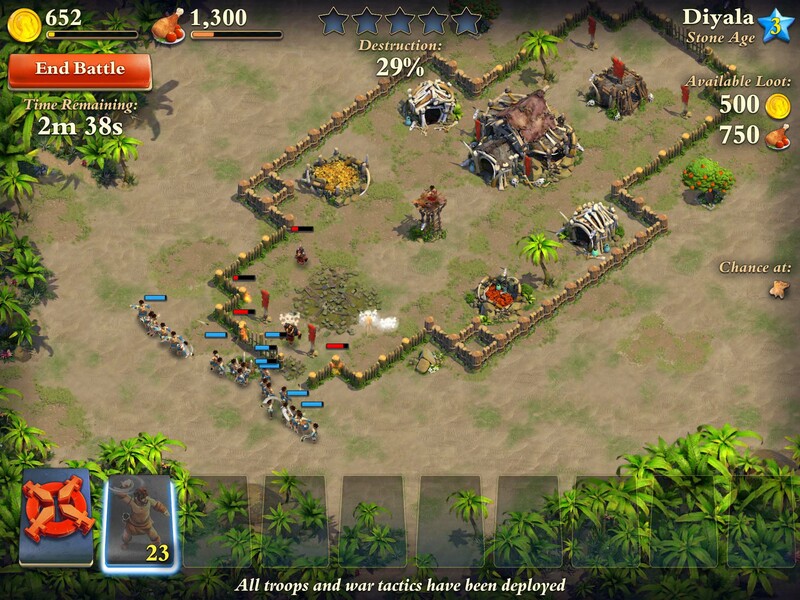 It’s all too easy to dismiss DomiNations (Free) as a Clash of Clans (Free) clone that arrived late to an over-saturated market. But with its theme of nation building, and a timeline spanning millennia, this is more like a free-to-play reimagining of Sid Meier’s Civilization. DomiNations comes to us from esteemed designer Brian Reynolds, noted for his work on Civilization II, which he designed while Sid was busying himself elsewhere. Project lead is Tim Train, who previously worked with Brian on Rise of Nations. The game opens with your tribe arriving in a forest clearing, where you build and defend a settlement, with the ultimate goal being to evolve from the Stone Age to the modern era, conquering other tribes on the way. 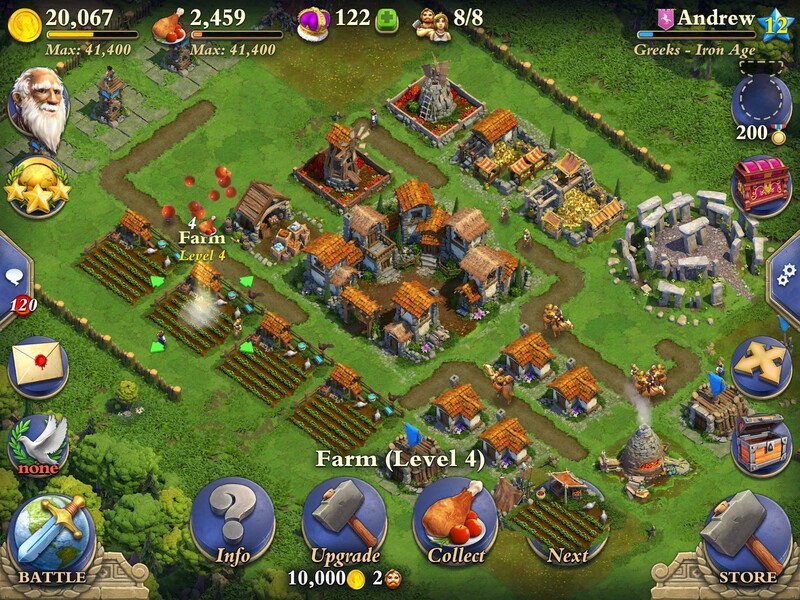 Much of the gameplay is about managing your supplies of gold (used to pay for buildings), food (used by workers as they carry out improvements), and crowns (used to speed up construction). It’s probably fair to say that the main reason to play DomiNations is for the pay-off of progressing through the historical eras, seeing the new buildings and gaining access to more advanced technologies. There is some major eye candy here. As your nation grows you can form alliances with other players, compete against rival alliances, and take part in leagues. 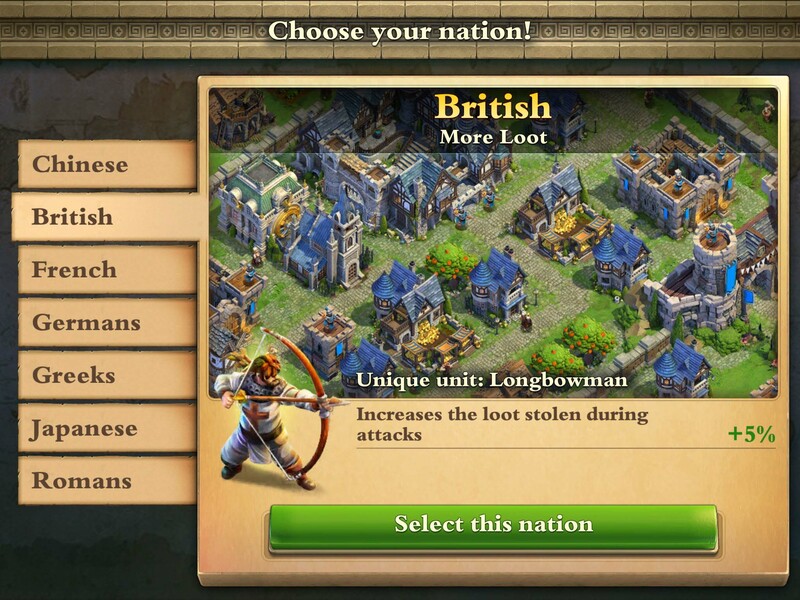 Once you reach the third era (the Iron Age) you can choose from one of seven nationalities, each of which has a unique technology and a resource boost. The graphics are exquisite, although some nationalities have nicer buildings than others. British, French and German buildings are all prominently blue, leading to settlements that look cold and bleak. By comparison, Chinese, Greek, Japanese and Roman buildings look rustic and warm. For the first couple of eras, anyone playing for free is limited to three houses and a population of six citizens, restricting how quickly your settlement can expand. An extra house is priced at 12,000 gold, effectively unattainable, but you can buy it in a $13 “starter pack". Those two extra citizens make a huge difference in the early game, allowing you to have multiple major constructions or upgrades happening simultaneously. Once your settlement becomes established and starts to grow, the game moves along at a nice pace. It does get a bit grindy as you approach the Classical Age when you’ll likely spend days (or lots of crowns) carrying out improvements. This sparcity of things to do is probably deliberate, to push you towards the multiplayer elements of the game, forming alliances and raiding other players. Raiding is practically identical to Clash of Clans. 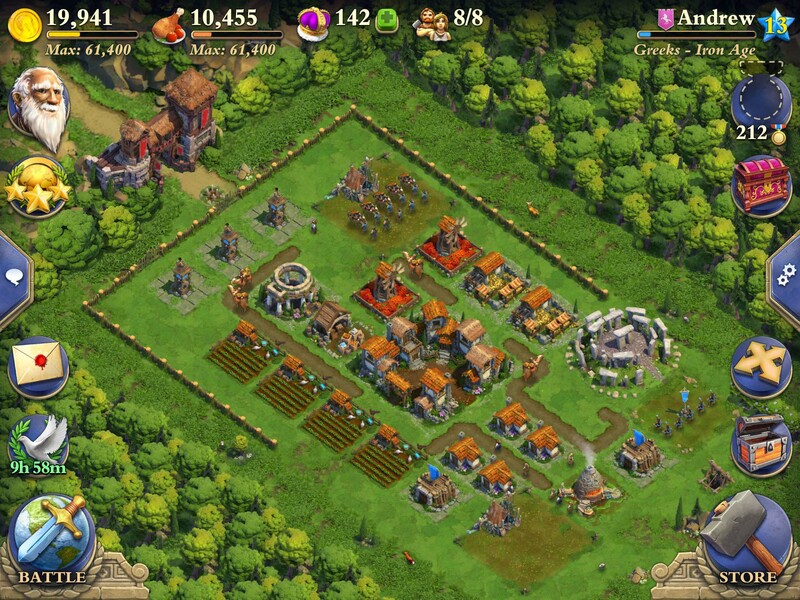 You choose whereabouts to deploy your troops on the outskirts of a rival camp, and just leave them to get on with it. Your guys can be frustratingly stupid, busying themselves with an attack on a non-threatening gold reserve while all the time a defensive tower picks them off one at a time. You can re-focus their attention on a specific building, but only once every 30 seconds. Over the past few days, DomiNations has become a bigger part of my life than any game I can think of since the PC version of Grand Theft Auto: San Andreas ($6.99). Even at meal times, I’ve got a fork in one hand and my iPad in the other. There’s a purity to the pleasure of developing your village, re-arranging buildings to keep everything neat, planning your next major expansion and working towards it. That’s not to say there aren’t faults. The game times out after a few minutes of inactivity, then restarts, which kills the immersion. There’s a bug (or a very questionable design issue) with upgrading farms and caravans, that causes them to produce a maximum of 4 food or 5 gold on their first production cycle, instead of the hundreds they should. There’s also something about barracks that I can’t get my head around: I’ve got two barracks, upgraded to support 30 troops, but I’m only allowed 25. That second upgrade doesn’t seem to have served any purpose whatsoever. I’ve thoroughly enjoyed the 15-20 hours that I’ve sunk in to DomiNations over the past five days. The drop off in pace from Iron Age to Classical Age was too sharp as it felt like I’d suddenly run out of things to do, but otherwise this is a solid game with exceptionally high production values and a fair free-to-play system.